Leigh Dumighan and David Newcombe have a lot to be thankful for just one year after their son Warwick was born. The smiling birthday boy was born under extreme complications that meant if he survived he would have a difficult life ahead of him. Born at 29 weeks gestation, Warwick arrived weighing just two pounds. On arrival, he was diagnosed with a bleed on the brain, heart problems and spent an agonising three weeks in intensive care. After a fungal infection gripped hold of his heart, doctors told the couple that if he pulled through he would still be severely disabled, not be able to see, hear, move around, or even know who they were. Three weeks after his premature birth, Leigh and David made the heartbreaking decision to take him out of his incubator, withdraw his treatment and allow him to die with dignity in their arms. They stayed with him in a private hospital room for eight days, giving him the cuddles they had been unable to and waiting for him to pass away. 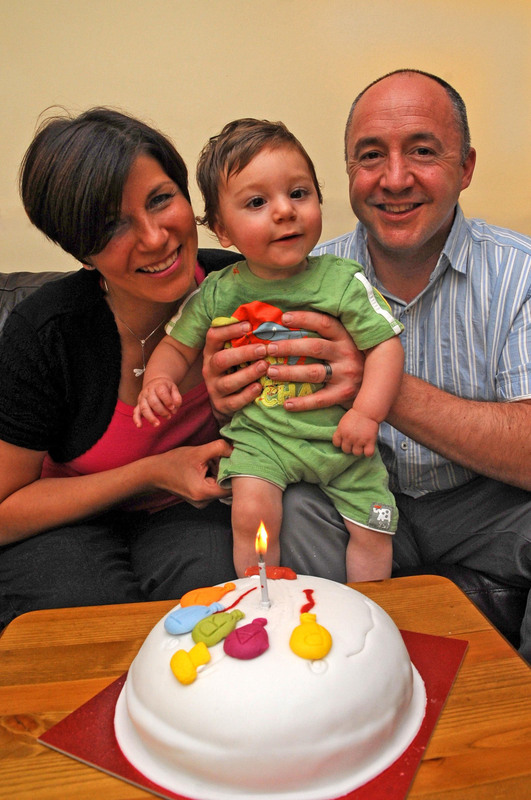 But astonishingly, and despite him stopping breathing 18 times, he battled to survive and has celebrated the first birthday his parents thought they would never see. Leigh said: “When we took the decision to let him pass away, it was the hardest thing we have ever had to do. “The prognosis was highly likely that he would be deaf, blind, bedridden and quadriplegic – the quality of life he would have had would have just been unbearable. “That’s why we decided to take him off treatment, I knew he’d had enough. “We wanted to give him all the cuddles and kisses every baby needs and deserves without all the wires and pain. “The hospital gave us a private room to say goodbye in and told us to get him baptised as quickly as possible. “We stayed in that room waiting for him to die for eight days, there were times when he stopped breathing and his face went a shade of blue and we thought it was it. “He was on a do not resuscitate order but he seemed to start himself back up. “He stopped breathing 18 times, the heart rate monitor went off and we prepared ourselves for the worst. “Warwick brought himself back to life, they didn’t even expect him to last one night – he had no drugs or treatment, nothing. “He slept with me in a bed in that room for those eight days, hearing my heart beating as he lay beside me, his skin on mine. After nine days in the care by parent room, doctors allowed Leigh and David to take tiny Warwick home to their house in Coventry, weighing just three pounds. Three months later he was given the all-clear by medics, who said he was not going to die. “We went to hospital on October 6 and saw a heart specialist and brain specialist. “That’s when we had the amazing news that the heart infection had completely cleared up and that he was going to survive. “Now when people see him who don’t know he has the palsy they have no idea there is anything wrong with him at all. “When he gets older I know he will be able to crawl and talk and the fact he is celebrating his birthday is amazing when you think about what has happened to him. “A year ago we made the right decision – I know that because he survived. “He is not meant to be here, but he is and I think it is a miracle. While this is not the outcome for all babies in this situation, this little man has shown us that he is a fighter. Nurses will tell you that they spend hours a day tweaking a baby’s oxygen, pressures and feeds, just to have them do better on their own terms.